We’re back with another Relief Chef Profile for our series giving you a bit more background on the AWOL Team. This time it’s the turn of Phil. 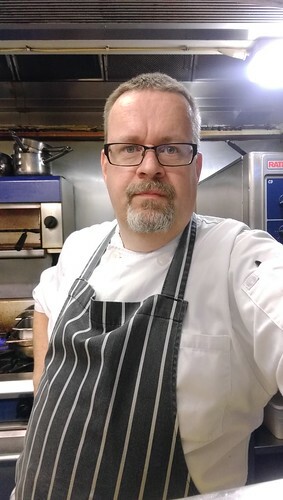 You can read all the AWOL Chef Profiles on the AWOL Blog if you fancy getting to know the team a bit better, but for now I’ll let Phil do the talking! 3. Best & worst things about relief work? Love the variety of the different places, one day in a care home and the next day in a hotel or restaurant. Worst thing is going into somewhere new for the first time and not knowing where anything is. 4. Strangest customer request you have had in the kitchen? Working in a care home once and having to liquidize a toasted crumpet with butter and jam, a first for me that one!!! 5. Best piece of kitchen kit you own or have used? Has to be a Rational Combi oven, recently went into a kitchen to discover they had ‘finally’ replaced a 30yr old oven with a bright shining new Rational Combi, I must have grinned like a Cheshire cat all day!!!! 6. Favourite thing to do on your day off? Spend time with the family and baking with my kids. 7. What would you do if you weren’t a chef? Always wanted to be a chef or a fireman as a young boy. 8.What would your last meal be? Would have to be a nice slow Hay roasted shoulder of Lamb with some creamy mash and veg followed by a chocolate fondant. Yum Yum.